Tonight's sunset photos are mostly from the "Stick your camera out the car window, click and hope" school of photography. It's not the best way to take pictures, but sometimes it's the only way. I was in a hurry tonight, taking Cayenne and Pepper to the dog park nearly an hour later than usual. That meant driving into the sunset. Pulling off the road to take pictures would have made us even later, and probably resulted in less of a view than straight down the middle of 22nd St. Also, my car windshield is currently filthy from a brief rain several days ago. So I snapped a bunch of photos whenever I could slow down for a moment or the view was particularly good. 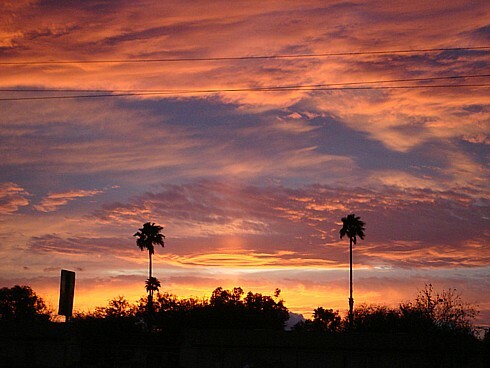 And now for the lame metaphor to justify posting sunset pictures and talking about something else entirely. As you may have noticed, I was a little upset the other morning when I posted a long rant about Lent and whether a person can really reform, whether I personally can reform and whether I've been slacking. Since then I've cleaned up the kitchen and several other areas of the house, done some shopping John asked me to do and finished and filed the taxes despite the fact that my doctor's centralized billing office never got back to me on my medical expenses for 2008. Even better, I'm currently finding it easy to keep the kitchen and bathroom clean. That's very unusual for me. I don't promise that this is a true amendment of life, a Lenten miracle. But for now things are looking up. Looking ahead down the road, I'm seeing the CPA studying crashing in again after the respite I bought myself with my latest seminar rescheduling. It's perfect timing, now that the house looks better and the taxes are done, I should have time to keep up with it, and I'm keeping up with the dishes. Over the years I've made a number of Big Announcements about how I'm going to do my homework with no more procrastinating, or lose weight, or exercise daily, or whatever the big goal of the moment is. But I learned years ago I'm not really like that. Sometimes I really do apply steady effort and accomplish great things, but it's not like flipping a switch, and for every success there have been failures. So no Big Announcement from me tonight. I don't promise that I will do all the dishes on Saturday, Sunday, Monday and beyond, or do X lessons a day online in the CPA review course. But looking back on the last few days, I see incremental accomplishment at least, and no reason I can't keep the momentum going for now. Extra Credit: Have you ever given up eating meat, either as a fast observance or as an ongoing change? Over the years I've tried to give up chocolate for Lent, or ice cream, or anything from a snack box or food machines at work (wherever I was at the time), or high carb foods in general, or just generally tried to lose weight. I've also tried giving up late nights at the computer. (Ha!) Do you see a pattern developing? I tried to use Lent as an excuse for trying to take better care of my own health. To some extent that's a valid idea. We should be good stewards of our own bodies. But when Lent is basically the same thing as a New Year's resolution, it's got little more chance of success than those have. Giving up for Lent has two advantages, though. It's for a finite period of time, and in theory you can keep yourself in line with the idea that if you eat that ice cream bar, you're letting God down! I know there have been times when I managed to at least cut back on the chocolate or whatever it was, but I don't recall ever completely avoiding a forbidden food for nearly two months leading up to Easter (40 days plus Sundays is how it's calculated). A children's computer game? What? 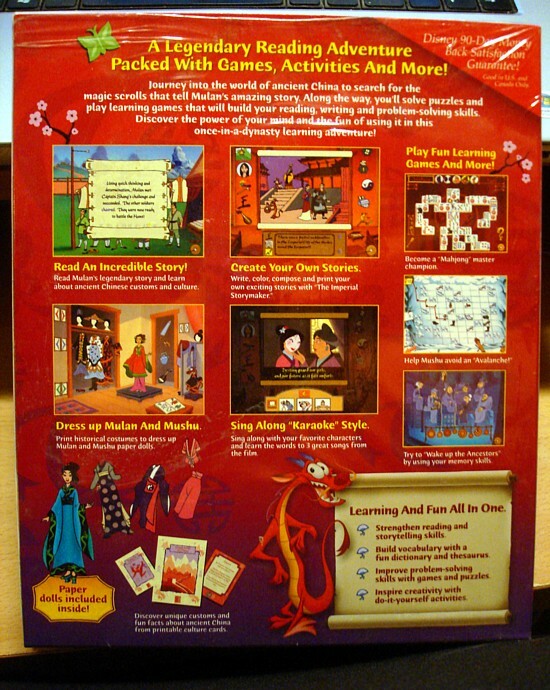 Well, I was a big fan of the Disney movie Mulan, and among my gifts that Christmas were a limited edition Mulan fashion doll and this suite of Mulan-themed computer games. Most of them had extremely limited appeal for a childless woman in her early forties, but there was one game that appealed to my serially-addictive personality. Can you spot it? Did you spot it, the real adult-friendly game hidden in the kids' stuff? Perhaps this will help! 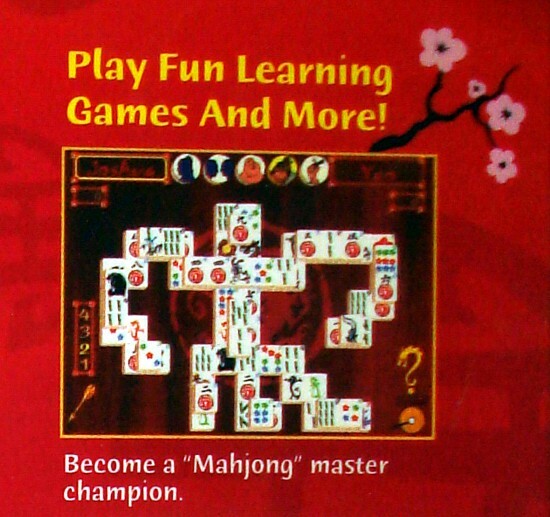 I had never played mah-jong before, but the computer version was simple to learn, and so much semi-mindless fun that I was soon playing it for hours every night, much as some people play card games on their computers at work - or used to, until greater temptations came along. So giving up computer games for Lent that year - no Muln mah-jong, no computer Monopoly - was a big doing-what's-good-for-me sacrifice to make. And for once, it worked! As for giving up meat, for Fridays in Lent or any other time, I'm really not all that good at it. If it's Ash Wednesday or a Friday in Lent and if I remember, I may forgo meat as leniently defined by the Church, meaning animals that don't come out of the sea. For Ash Wednesday this year, I managed it, although I had to drive around a bit, because I had my heart set on a shrimp or fish sandwich after church, and Popeye's was completely out of shrimp. Ever hear of Lent, you guys? Anyway, I can't imagine giving up meat completely, but I applaud those who do so. So, this is a topic with which I am intimately familiar. My husband is a lawyer and accountant specializing in small business law in the Russian community in Brooklyn, NY. As a result of this, I am basically single between February and April 15th every year, which is why I am keeping myself busy by taking so many classes this semester. One of the few bonuses is that all I have to do is sign the returns. We generally do our taxes fairly early because past years have proven that if we wait, he becomes overwhelmed with work for clients. We had planned to get to work on our taxes this weekend, but as plans often do, it fell through, partly due to the somewhat more urgent matter of replacing Tall Paul's car. We're not usually in a real rush to get our taxes done anyway, since we are in the unfortunate subcategory of "have to pay" on our Federal taxes. And even if we don't owe the state of California any additional taxes, they'll owe us; they'll be issuing IOUs instead of refunds. Let me start by saying we don't do our own taxes. 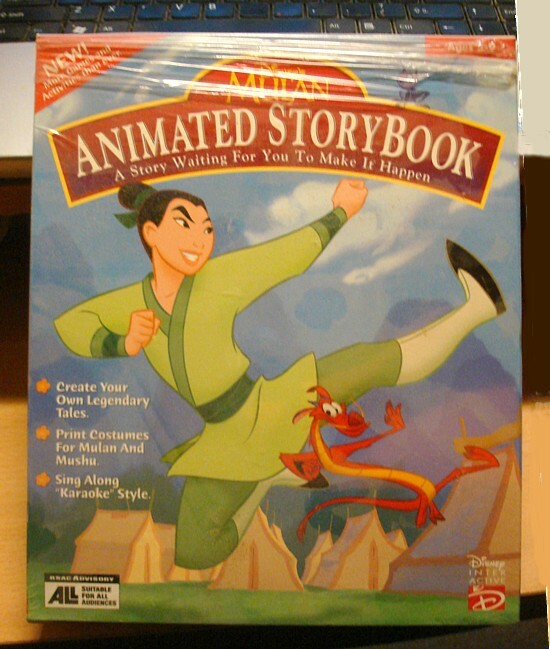 I know that there is software out there that makes it so easy a child could do it, but I know I'll mess up something. I don't want to go to jail. I'm too fragile. Either that, or I'll end up missing out on some good exemptions. We all need every exemption we can get. I always prepare our taxes and do so manually. As I mentioned above, I have experience with both TurboTax and TaxCut, for me it is just easier and cheaper to file manually. It took me an hour and twenty minutes to complete both returns. I did use the amt calculator on the irs.gov web site to make sure I didn’t owe AMT. Wisconsin is offering free electronic tax filing this year, but I didn't take advantage of it. That's it for now! Remember, I'm always looking for Weekend Assignment topics, so don't be shy! I've been sitting here all night, trying to think what to tell you about all the vague ideas that have been swirling in my head. Yesterday was Ash Wednesday, so I didn't eat much all day. I worked at St. Michael's in the afternoon, and was one of only two acolytes serving at Mass in the evening. Lent has begun, that season of repentance and abstinence, of taking stock of one's life and amending it for the better. 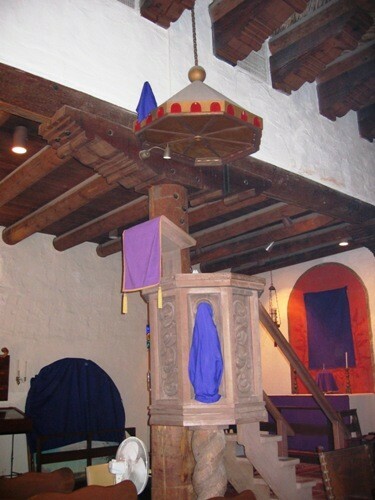 Everything at church gets covered up with purple cloth, signifying (as some religious book I had as a kid put it) sorrow for sin. Well, in theory that's what Lent is for. We prepare for the memorial of the death and resurrection of Jesus, and review and renew our relationship with him. Traditionally that involves going to church a lot and not eating meat on certain days, confession of sins and so on. The most famous manifestation of it all is the idea of "giving up something for Lent." Father Smith at St. Michael's has argued against this concept for years. Instead of giving up chocolate, which doesn't accomplish anything spiritual, one should do something positive that brings you closer to God. But...how do I do that? Every year I try to find a way, but somehow Lent always ends up seeming like a missed opportunity to accomplish something meaningful. So that's one track of what's been on my mind. Overlay onto that the continuing discouragement of no job interviews - not even a nibble! - and the suspicion that I won't get a job anytime soon, and what is wrong with me, and how can employers know without even picking up a phone that they should pass me over for all those jobs that they list that seem to fit my skills perfectly? And the CPA review thing is a longer and harder slog than even I expected, let alone John, who is restless over what seems to him like a lack of progress on my part. And yes, I should put in more hours each day on the studying. There, I said it. But doing it won't be that easy. There are no quick fixes here, no magic way to prepare for the CPA exam as fast as John wants, even if I do the diligence of eight hours a day studying. There's too much material I've forgotten or never knew. It will take months and months to get through it all. Even if it were all relatively fresh in my mind from school four years ago, it would still take months and months. Sorry, John. Sorrow for sin. Yeah, I've got that. The sin of despair. The sin of giving myself a break, or not trying long enough or hard enough, of not washing the last dirty pan or getting the last bit of dried food off that section of counter. The sin of being stuck. Yeah, I'm sorrowful. Okay, I repent. Now what? Now I try to do better, right? Except John would echo Yoda, "There is no try." Phooey on that. I can and will do better, but I know it will never be enough. That's human nature. When I worked for Buzzard's Nest Records all those years ago, I used to say to myself, "I have to be perfect this week," because anything short of that would be pounced on. But it's an impossible standard. Nobody can be perfect this week, or any other week. On the other hand, who says I have to be perfect now? What John is looking for is visible steady effort and noticeable results. Well, okay, let me recommit to the effort. But I can't guarantee the results. 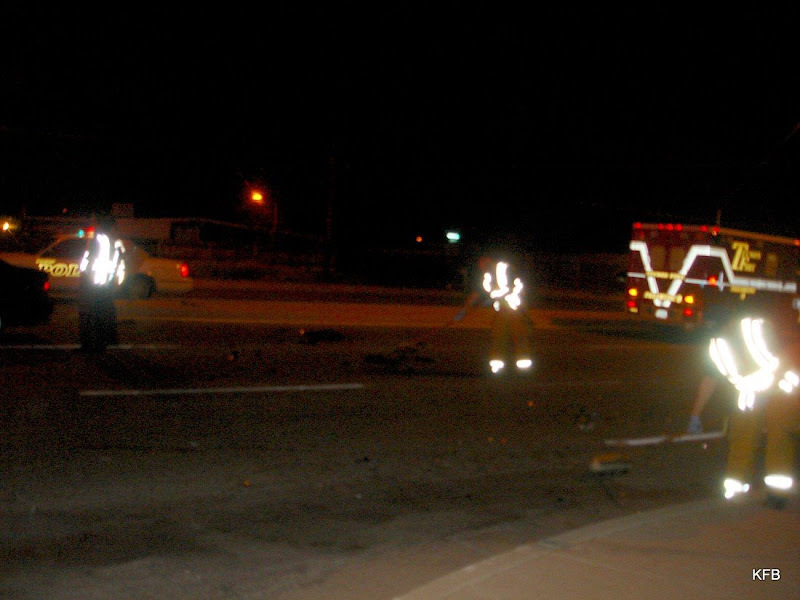 With all the photos I've had to show you over the past week, I forgot to even mention the serious two-car accident that happened about 25 feet from me on Friday evening. 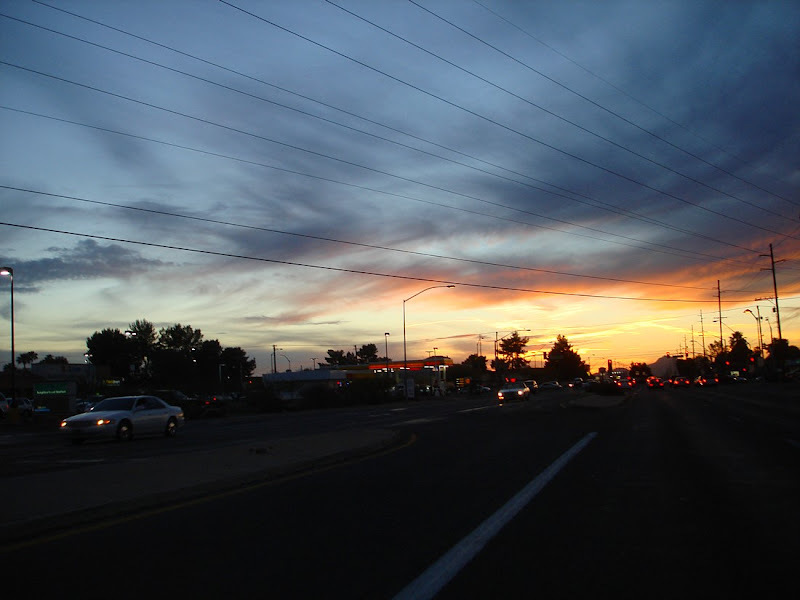 I had just pulled up to the corner of Wilmot Rd on a side street called East Calle Marte, from which I intended to turn left onto Wilmot, bound for Safeway. About a second later, two cars crashed into each other right in front of me and spun around. The SUV or minivan or whatever it was pulled off the road into a neighbor's yard, and the sedan backed up a few feet and stopped, facing south next to the median on the northbound side of Wilmot. It was such a shock that I screamed. A second later (if I didn't pay attention) or a few feet of difference in trajectory and it could easily have been a three car accident, with my Eagle Vision as the third car. 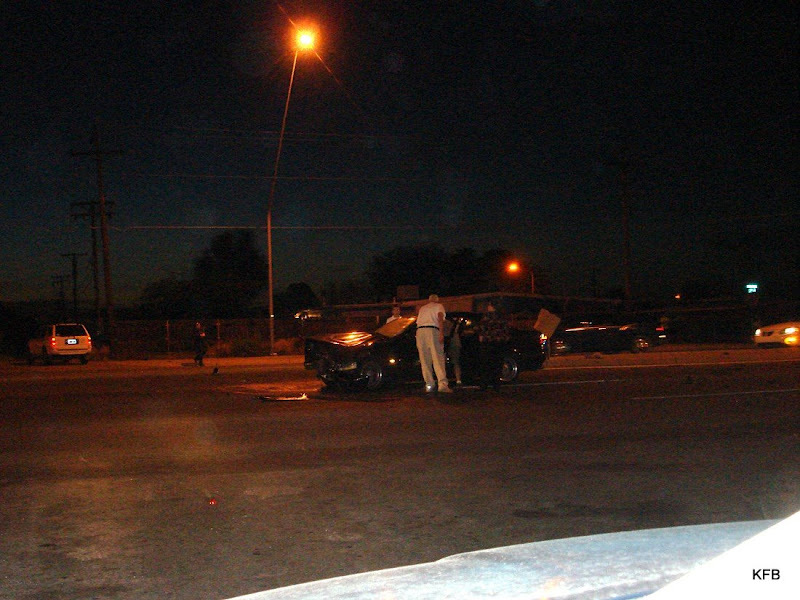 Other cars from other directions immediately stopped, and people ran to check on the driver of the sedan. I stayed in my car and called 911. Sorry about the angle. The white and blue areas at the bottom are my car. 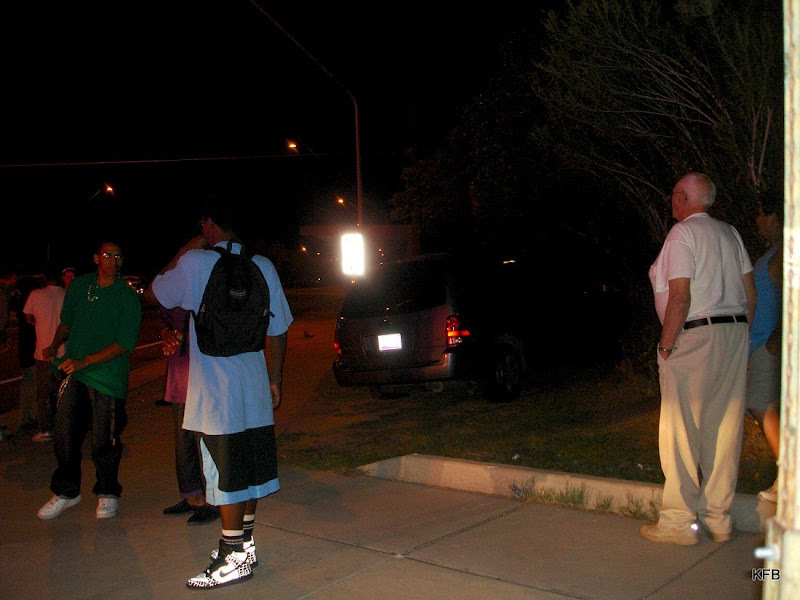 People in the neighborhood and people waiting for buses quickly gathered on the curb and sidewalk. 911 asked whether there were injuries and connected me to the police, who confirmed the name of the side street and asked for my name and phone number. I saw someone else on a cell phone before I finished. The fire department arrived about two minutes later, being stationed just a few blocks up Wilmot from the accident. I quickly realized I wasn't going anywhere for a while. 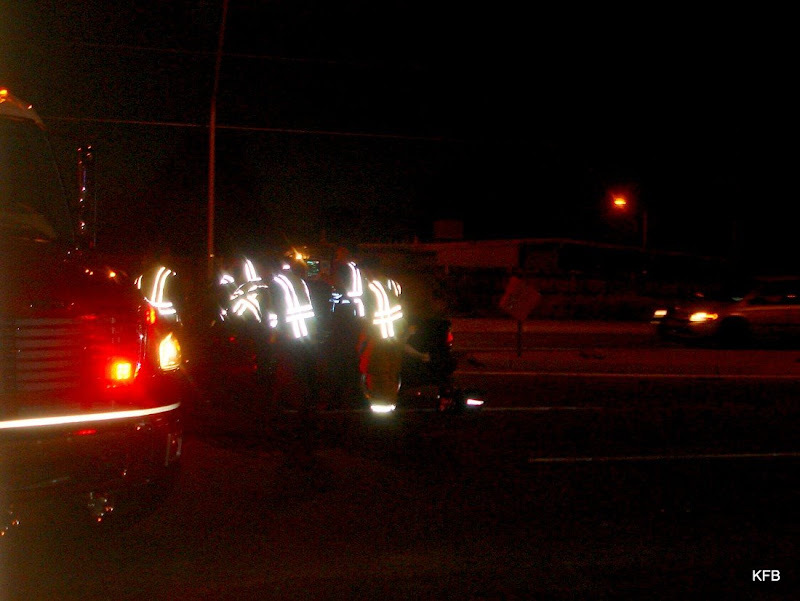 Not only was I interested in documenting the accident, but I was pretty much trapped. 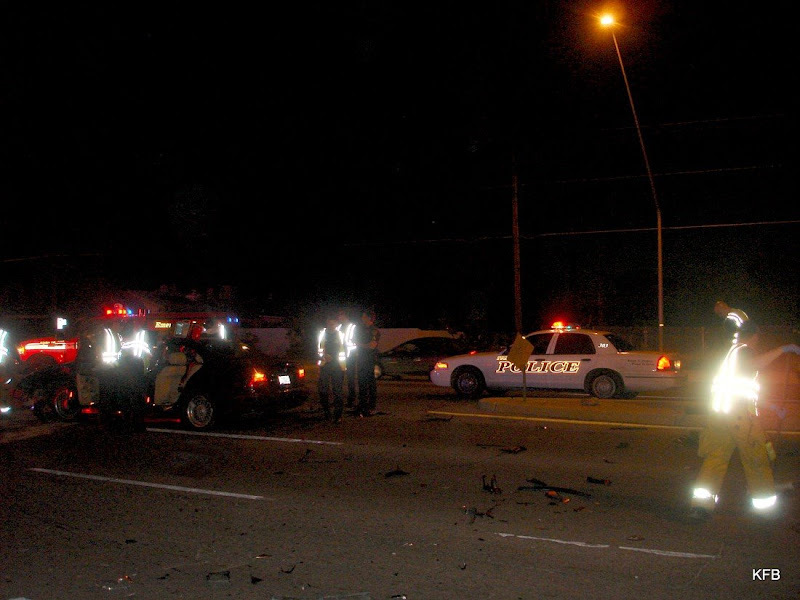 Wilmot was blocked northbound and partially blocked southbound. Diverted cars were turning right onto Marte in a steady flow, leaving me no opportunity to back up and turn around safely. 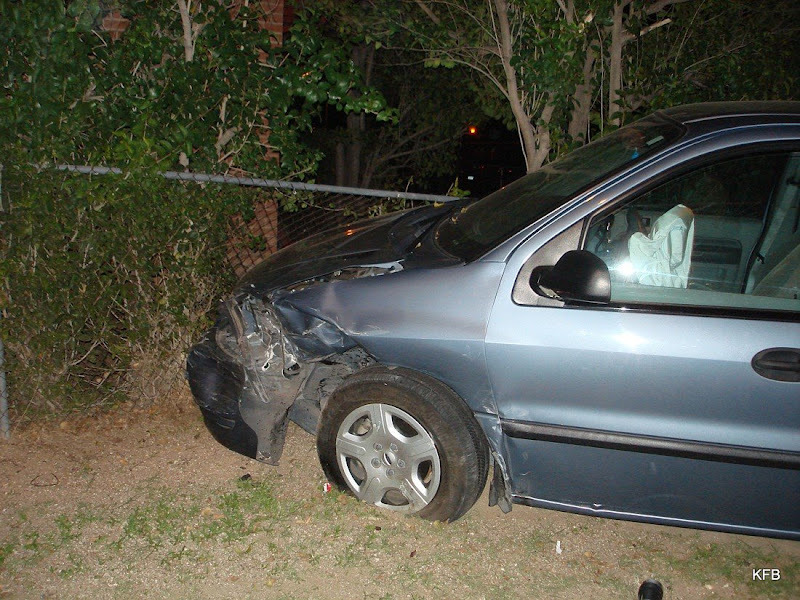 The other vehicle was relatively unscathed - at least from the back. The police arrived about two minutes behind the fire trucks. 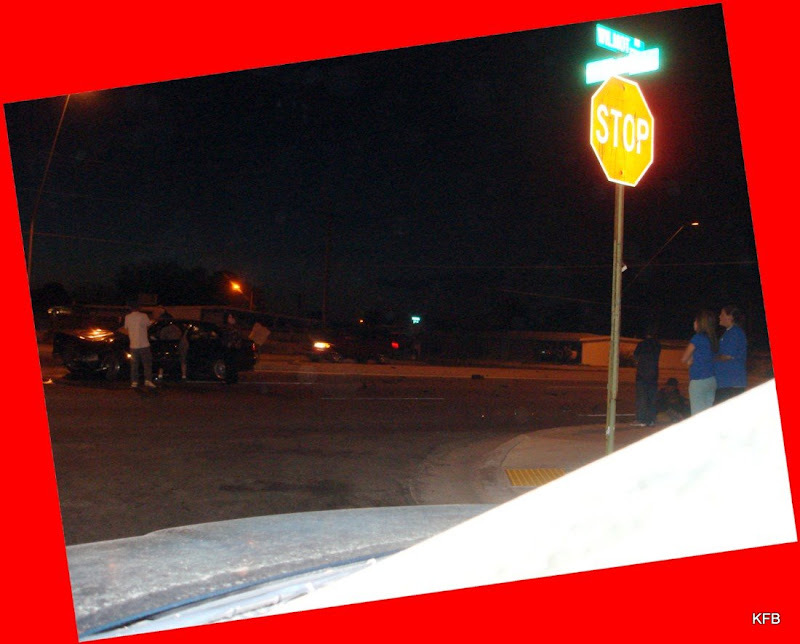 Nearly all the attention was directed at the occupant of the car that was still in the street. I got out of my car and asked the driver of the minivan whether she was okay. She was. A kid in a green shirt asked me if I saw what happened. 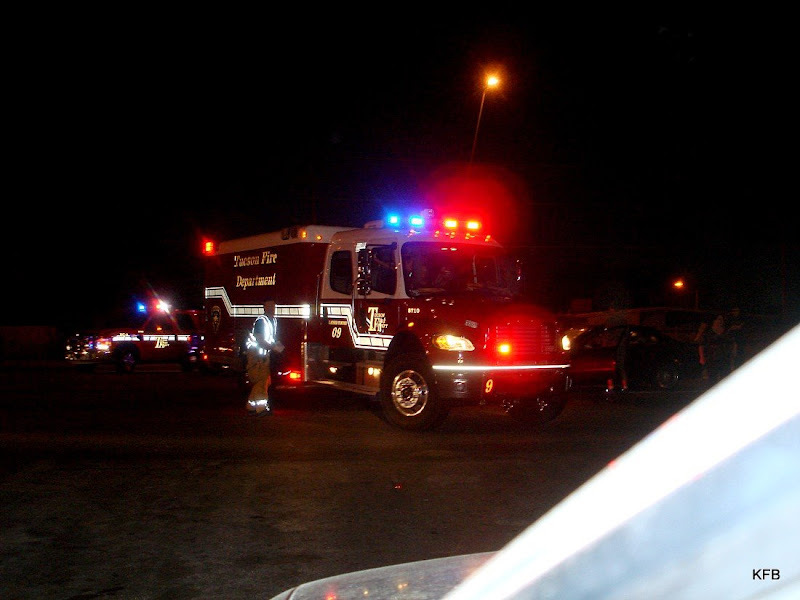 As I tried to describe what I'd seen of the accident for a third time (after the 911 and police dispatchers), I suddenly realized that I wasn't sure where each vehicle started from and what each driver was trying to do. Was one turning left onto Marte and one turning left off of Marte just ahead of me? Was one turning on or off of Marte when the other came speeding up Wilmot? I'm still not sure. I make a lousy witness! The kid in green pointed out that the spinning cars and heavy damage and huge debris field in the street pointed to a high rate of speed. I had to concede that he made a good point! ...some of the fire department folks got out brooms and swept up the wreckage. I wondered whether the police would ask me anything in person, and whether I had anything remotely useful to say, given my failure to observe and remember exactly what happened. A policewoman who was directing the traffic onto Marte looked askance at my car, still in the way, still trapped, still with its lights on. I went over to her and explained my predicament. "You need to back up and turn around," she said. I told her I understood that, but didn't think I could do so safely given all the incoming traffic. "I'll help you," she said, and held up traffic long enough for me to make a K turn and get out of there, for which I thanked her. I won't be turning left out of Calle Marte for a while. For Ellipsis Monday Photo Shoot #26: Hit Me With Your Best Shot!, Carly is looking for our best photo within our particular photographic specialty. I suppose there are two areas I tend to specialize in, which sometimes overlap. 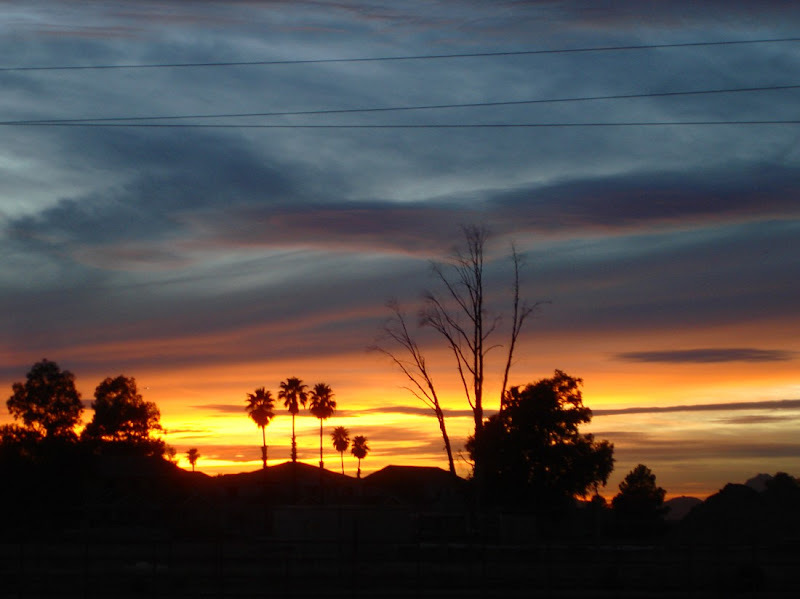 I love to photograph Tucson and Arizona generally, which usually means landscapes, and specifically sunsets or desert or dramatic weather, or some combination thereof. And I love to photograph dogs and other critters. Sometimes I get lucky with a dog or wildlife photo, but I there's little question that I'm better on landscapes. I don't have a fabulous camera or a ton of patience for tweaking camera settings or waiting for the perfect shot, so I compensate by taking a lot of pictures and hoping one or two will be good ones. The advantage of a landscape is that my subject isn't going to fly or run away. A little way up Mount Lemmon, Mar 15, 2005. Canon PowerShot S410. On the other hand, sunsets require the right venue and good timing, and I do make the effort sometimes because the rewards can be pretty great. 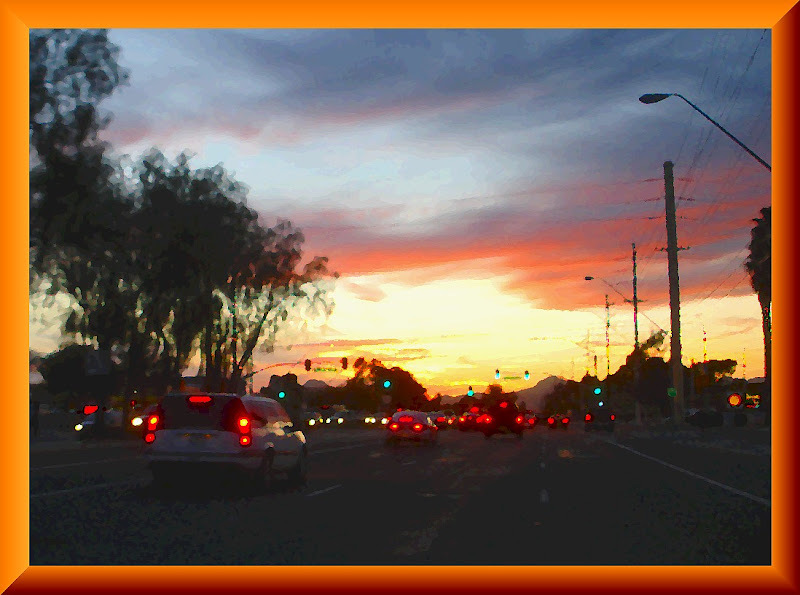 When I first got my digital Canon in 2005, I was forever driving toward the mountains after work, trying to get the kind of Tucson sunset one finds on calendars and postcards, with a nice saguaro and maybe some mountains. 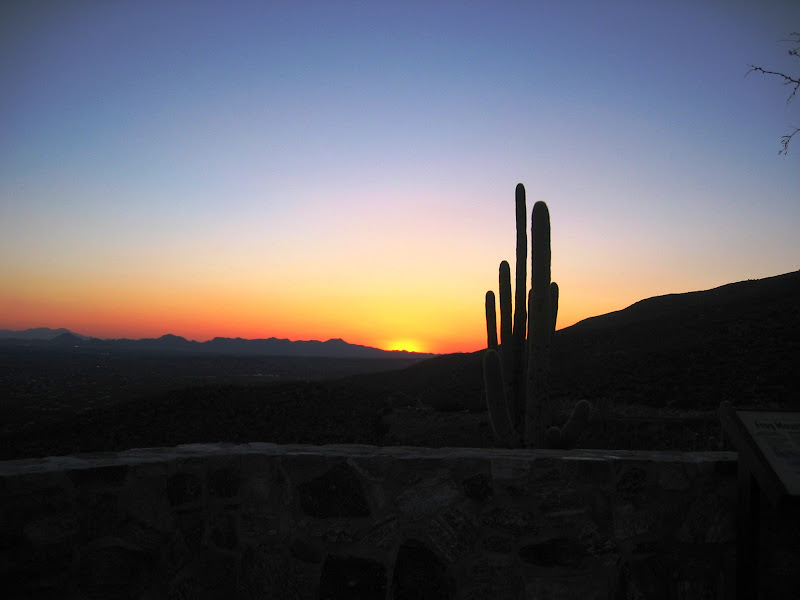 Ask me tomorrow and I may show you the blue one or the orange one instead, or the one with the lovers at Gates Pass; but tonight the one shown above is my favorite sunset photo of that era. Safeway Sunset (Angela's Sunset), Jan 6, 2008. Above is a photo of probably the most dramatic sunset I've ever seen. The venue was fairly ordinary - the parking lot of Safeway Plaza at Wilmot and Golf Links, in front of Subway. I was on the other side of town that day as the sun went down, and could see it was probably going to be an especially good sunset because of the clouds. I raced to Safeway Plaza because across the street was an empty lot with trees and mountains to add interest, and no buildings to get in the way. As it happens, I'm in a mood tonight to criticize the actual photo. I don't like the way the trees look. 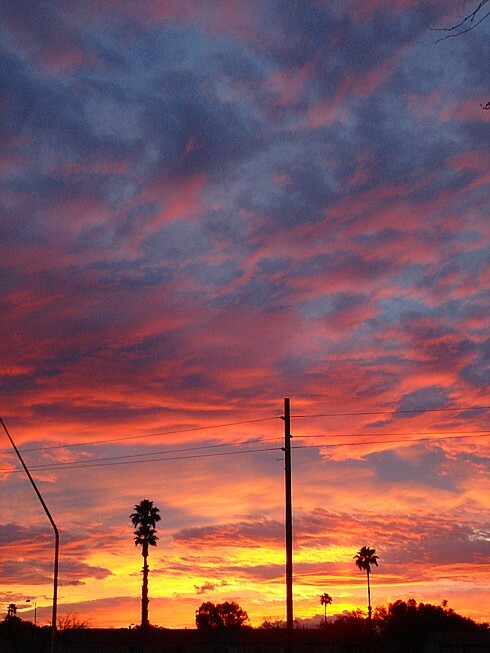 But there's no denying that the sunset itself that evening was fabulous. It was so impressive that the departing curate at St. Michael's, Rev. Angela Emerson, mentioned that same sunset at some length in her final sermon for us. I sent her a copy of this photo as part of a going away gift. Here's another shot of the same sunset. I've never quite figured out which version I prefer. Miko's Corner Playground, Nov 12, 2008. Same SONY camera. 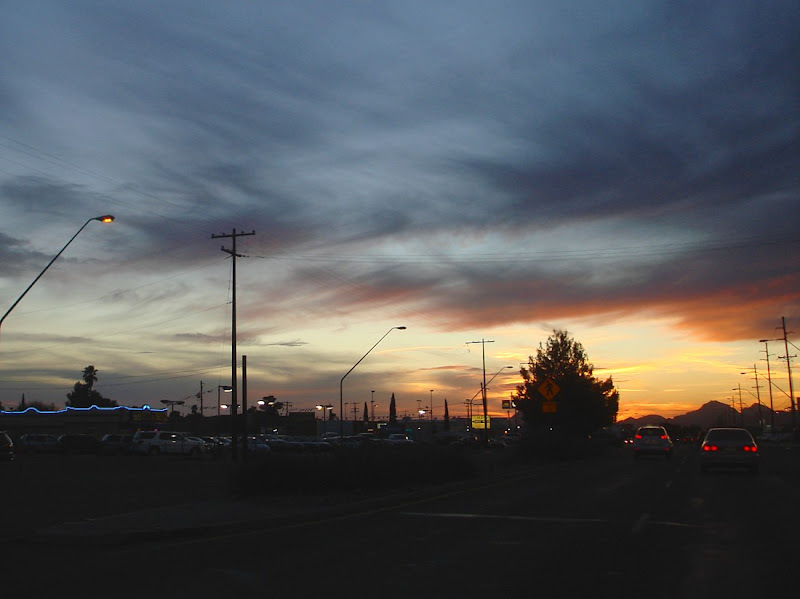 Safeway Sunset, February 23, 2009, same camera. Okay, so it's not quite ruined! Be sure to check Carly's blog Ellipsis every week for the Ellipsis Monday Photo Shoot, with links to the previous week's participants. (Which reminds me; I've got to make my rounds!) Before I sign off, though, I notice that Carly asked us a question this week, about what our first camera was, and wether we still have it. Mine was a cheap plastic no-name flash camera, which we bought Dad for Father's Day circa 1965. Later we got him a Kodak Instamatic for Christmas, and I got the old one as a hand-me-down. At some point Dad got a decent 35mm SLR, and I got the Instamatic. Next step up was a Poloroid OneStep circa 1976. My brother Steve gave us his old Canon AE1 as a wedding present, I think, which I used until it was stolen out of the van in late 1986. Then it was the Chinon, which I dropped and dented(!). Our first digital was a SONY Mavica, which stores photos on floppy disks! That one we still have. Let's wrap up my series of photos from Gene C Reid Park (for now!) 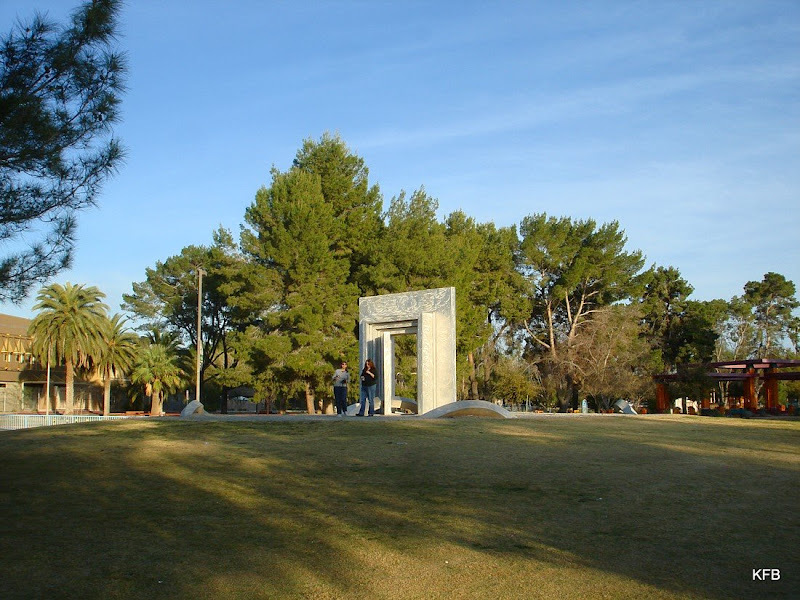 with a closer look at three park landmarks that the dogs and I explored on Friday: the duck pond, the "doorway" sculpture and Cancer Survivors Plaza. I'm afraid I have not yet been able to find out the title or artist of this large sculpture near the corner of S Lakeshore Lane and E Landmark Place. 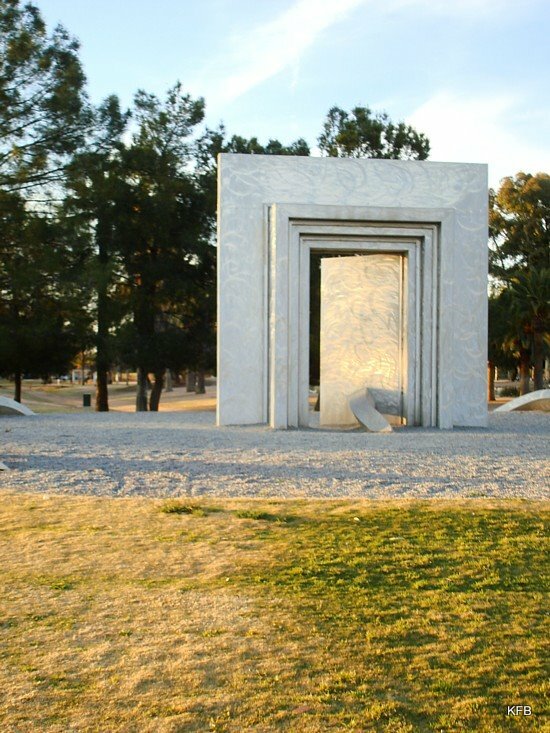 It looks like a doorway, with the door slightly ajar. Next time I'll get close enough to touch it and find out what it's made of, and check more carefully for a plaque. I think it's etched metal of some sort. 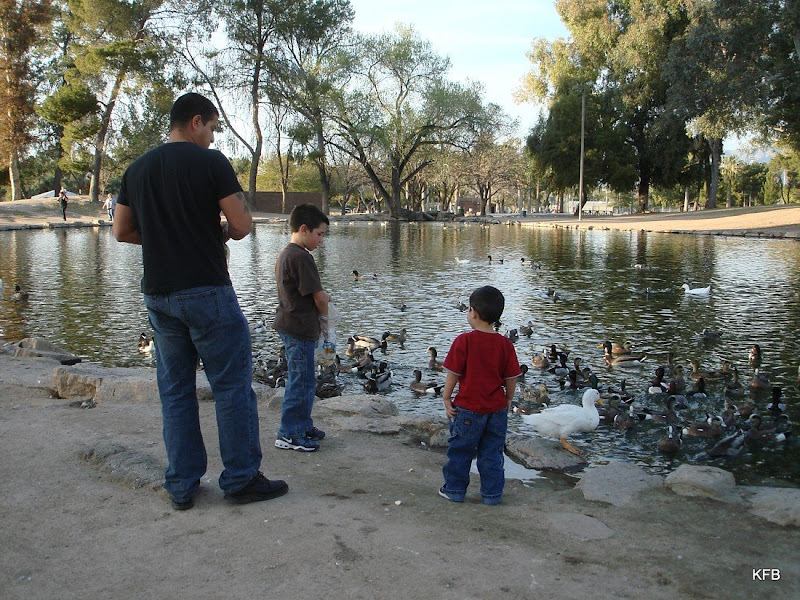 This blog is getting uncomfortably photo-heavy, but I want to work in one more of the duck pond shots. 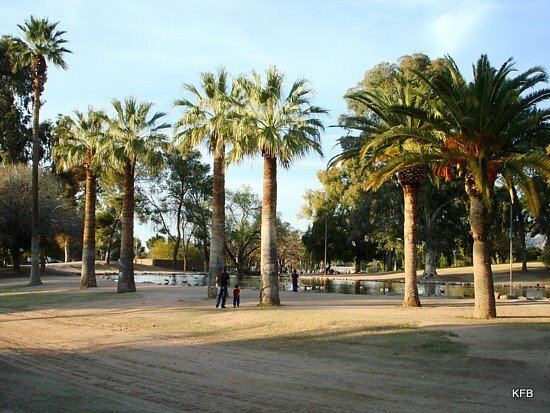 The Tucson Parks and Rec site calls the two duck ponds in Reid Park "urban lakes." A web site reviewing the place claims that the goose don;t bite and that nobody will mind if your dog jumps into the water - as long as you don't make a habit of it! Tucson does have leash laws, so for that and other reasons, I'd rather not put this claim to the test! 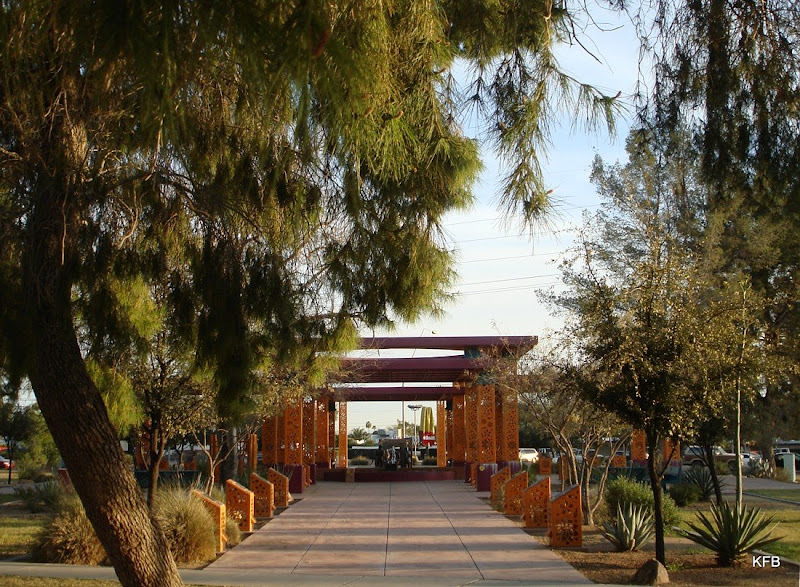 Here is the approach to Cancer Survivors Plaza. As a fan of bright colors, I feel I ought to like the orange pillars much more than I do. 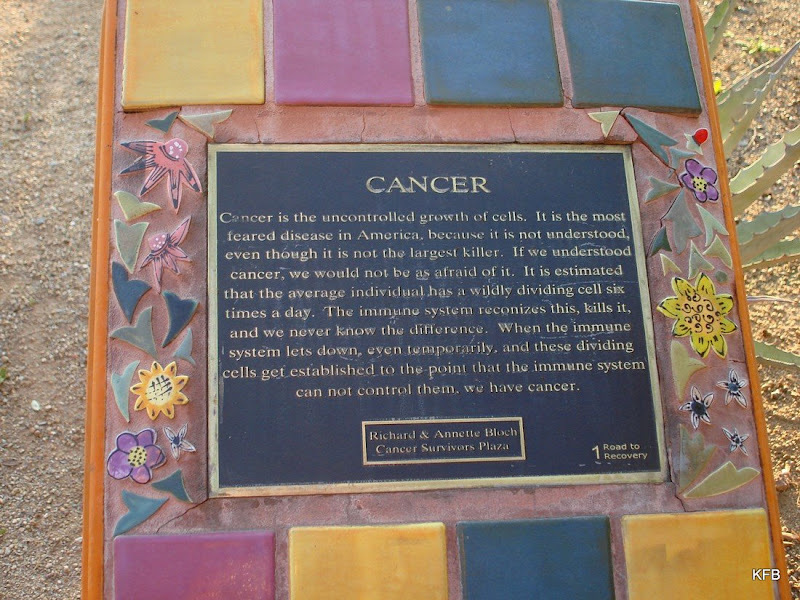 The short ones are a series of plaques about cancer and cancer treatment and the sculpture itself. The first of the informational plaques. If we can just get through this maze representing cancer treatment, we can go to McDonald's! Woo-hoo! Here's the top of the figure Pepper was sniffing in my Round Robin entry. Cayenne hangs out with the supportive grandparent figures. 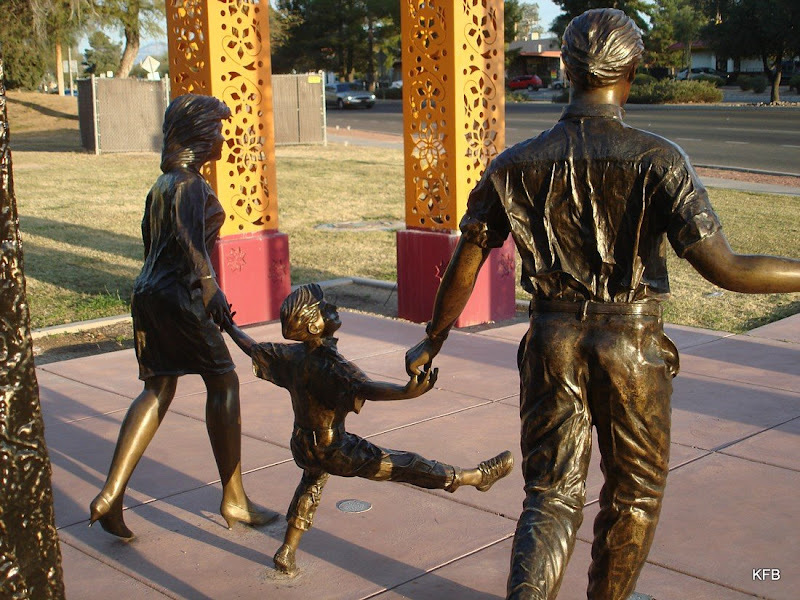 According to a plaque, the entire sculpture (all the bronze bits) is titled "Cancer...There's Hope." 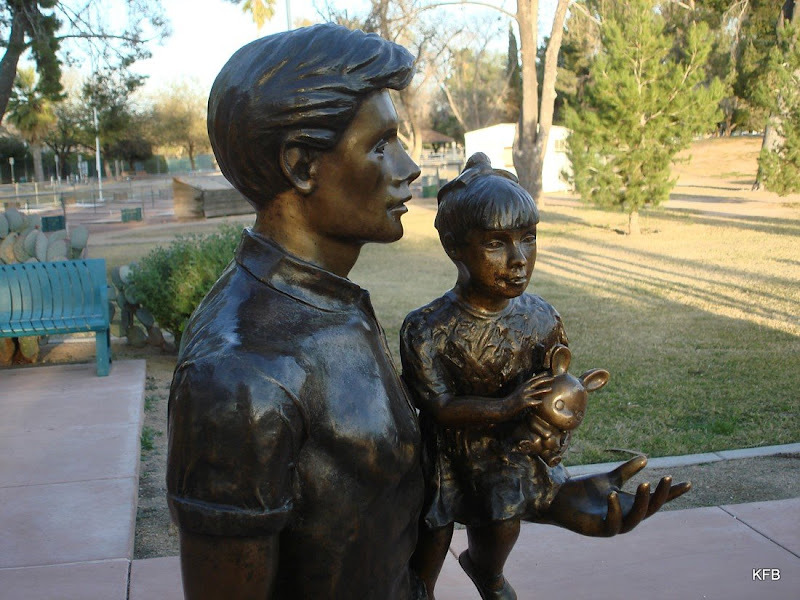 It was the last work of artist Victor Salmones. 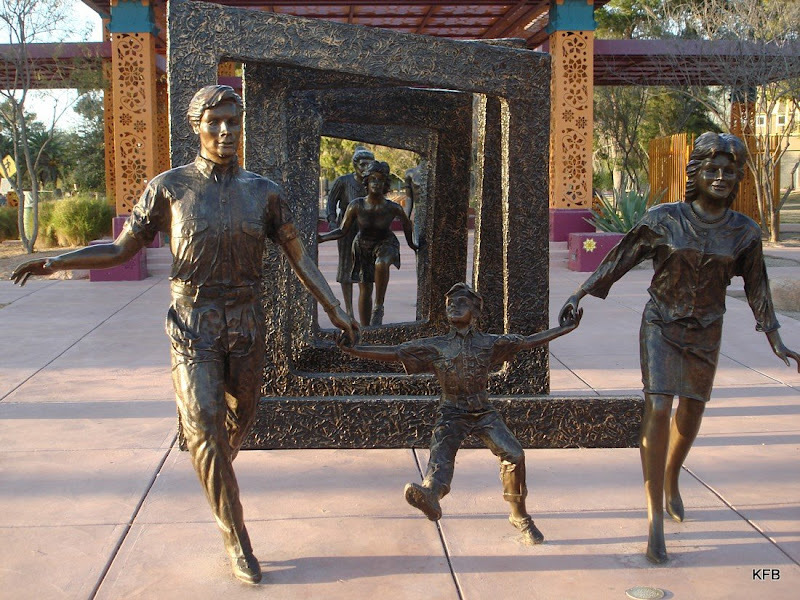 The five figures at the back - a dad and his Picachu-toting little girl, the grandparents and a young woman - represent cancer patients and their supporters as the patients enter the maze of treatment with fear and determination. The three figures at the front - two parents and a boy - have joyfully emerged from the maze of treatment with a successful outcome. I've marked up a Google Map to show you points of interest in Reid Park. The marker on the left is the dog park. You can see the two "urban lakes," and the Cancer Survivors Plaza is at the bottom (south) edge of the map. The Animal Fair on Saturday stretched from near the dog park to just northwest of the Doorway sculpture. The birds and the beasts were there! Not a baboon or an elephant, but horses, donkeys, llamas, ferrets, cats and dogs. Lots of dogs. on the side of the trailer were more photogenic. Friday, Feb. 20, 2009. Okay, I should back up a sec and explain what I'm talking about. 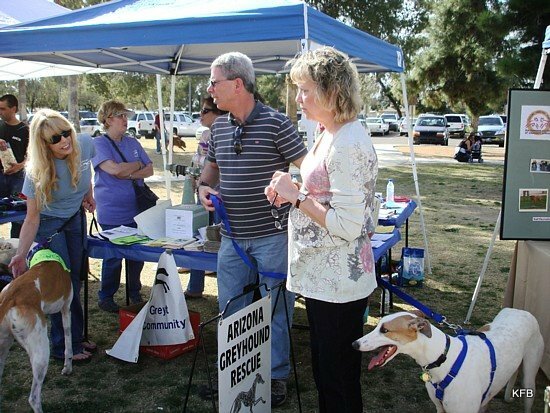 There was an Animal Fair at Reid Park today. 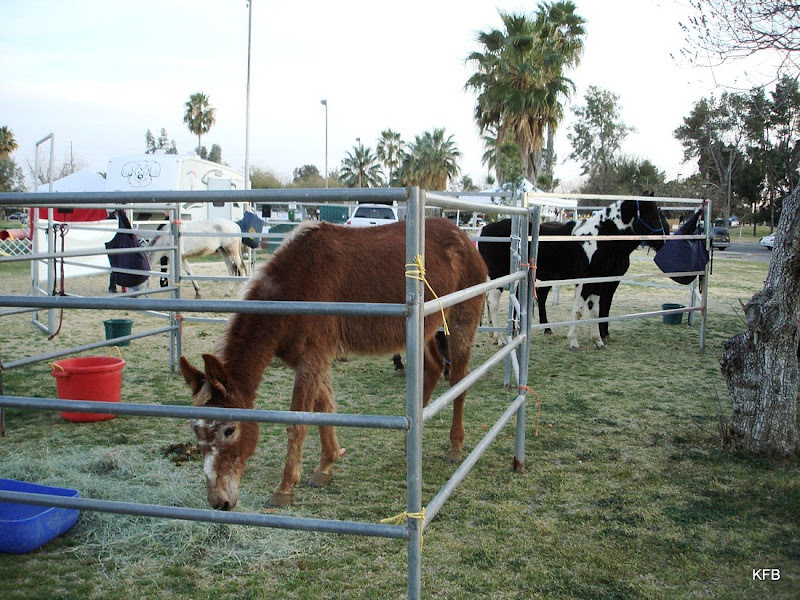 I knew about it because I happened to see some rescued mares and a mule in adjacent corrals at Reid Park late yesterday afternoon. And oh, yeah. 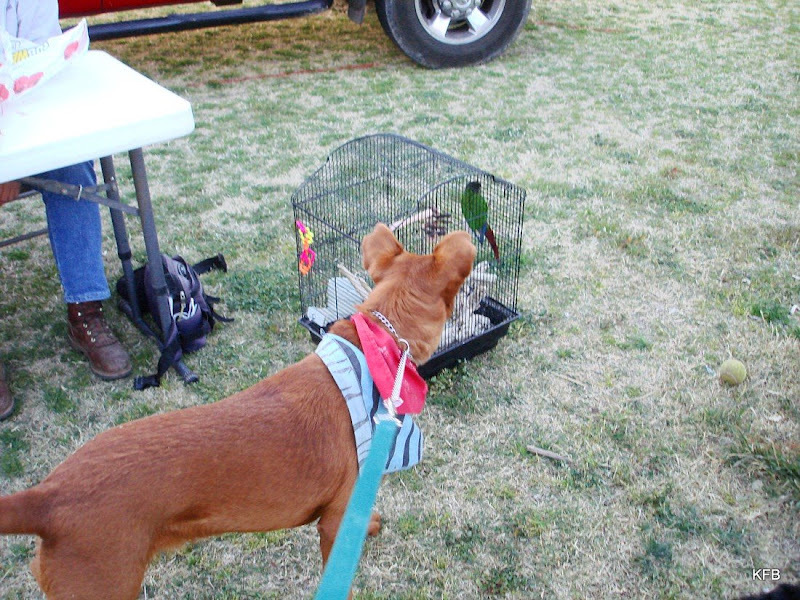 Cayenne met a bird named Petey, which was also the name of my brother's parakeet when I was about five years old. I don't think Petey liked Cayenne very much, but Cayenne liked Petey. 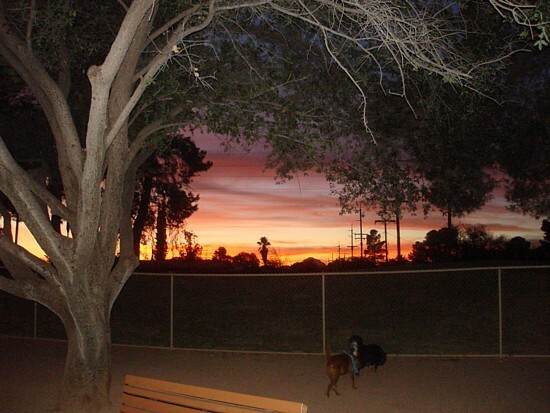 So this afternoon after I gave blood, I took the dogs to the park. The parking lot was completely full, so we ended up on the other side of Country Club Road a block away. Lots of people were coming and going from side streets and parking lots, many of them with leash in hand. 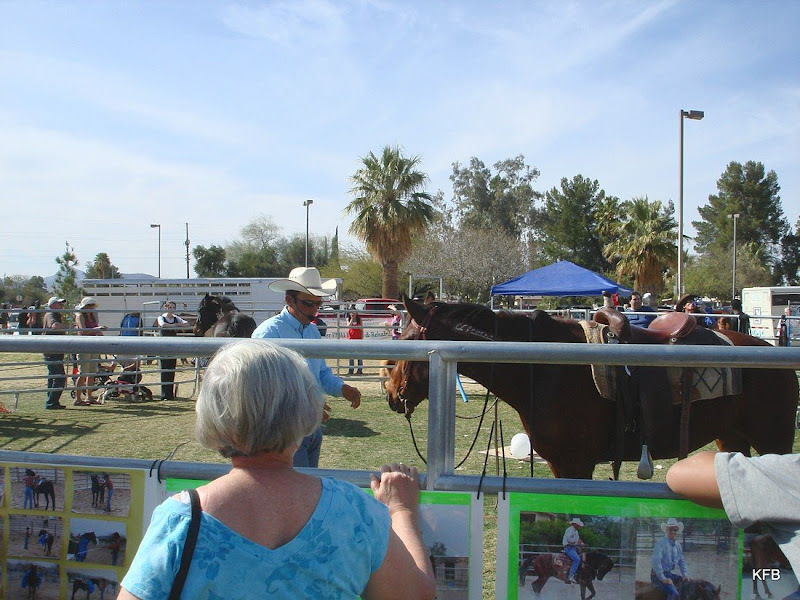 When we arrived, a man was doing a presentation about the rescued mares, and how to identify a particular brown horse from all the other brown horses in the world. SAFE was there, the same group from whom we got Pepper 11 months ago. 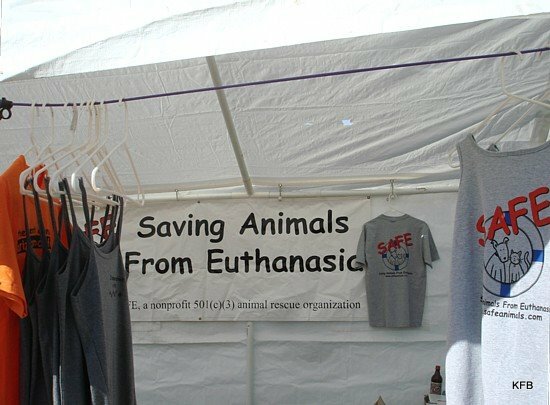 So was the Humane Society, and one of the volunteers there remembered Cayenne. I even got a chance to catch up a little bit with Karyn Garvin, the trainer who helped us with Tuffy when she was a puppy. 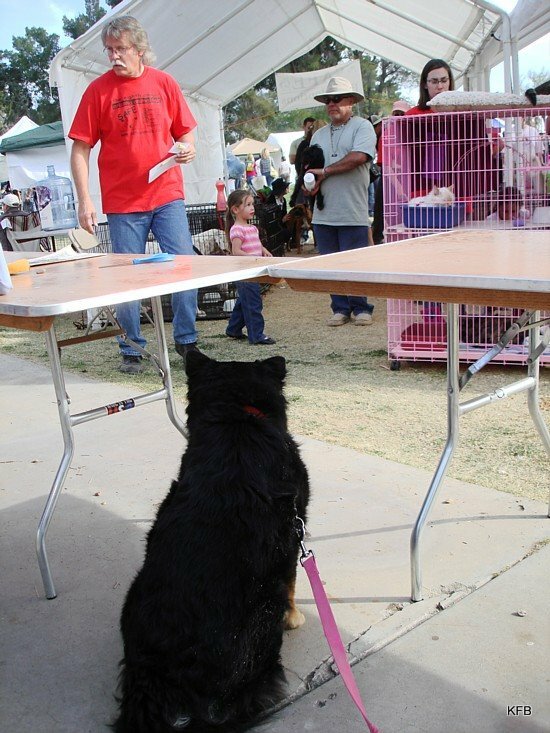 There were lots and lots of dogs about, either up for adoption or being led from booth to booth by their owners. But I wasn't kidding about the other species. There were burros, several kinds of horses...and even llamas! 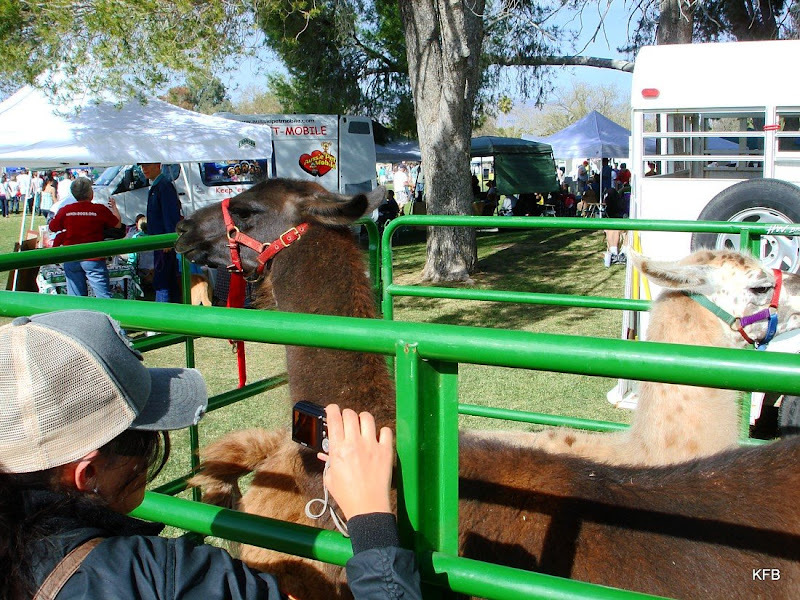 Yes, Arizona has a llama rescue group. If you have an abandoned pushmi-pullyu, I expect they'll rescue that, too. 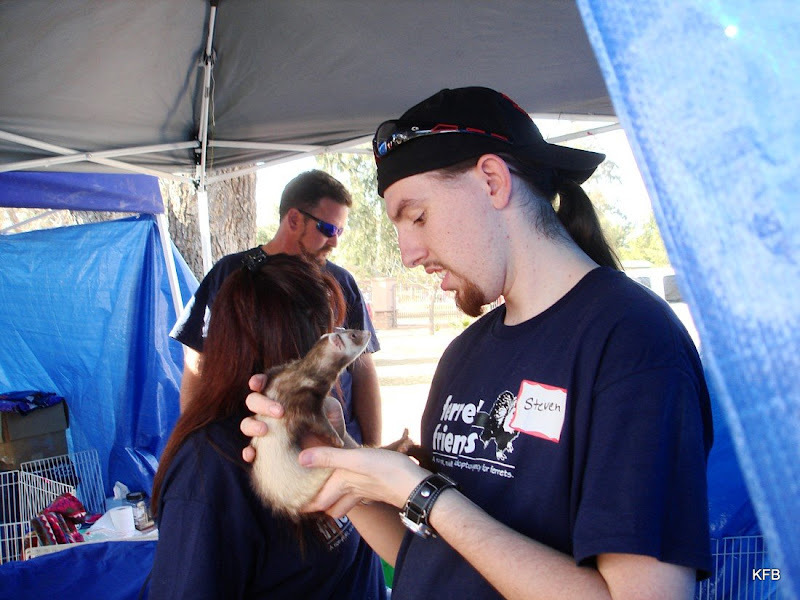 There was also a ferret rescue group. No, the dogs aren't getting fresh with the blonde woman. They're just trying to get closer to the ferrets! ...miniature pinschers (nicknamed "minipins," to my temporary bemusement), springer spaniels and I forget what else. There were people hawking dog training, grooming, natural dog food, canine tooth cleaning at home, dog-themed beer, an alleged pet psychic, and the usual kettle corn, lemonade and other standard fair food. The sun was beating down, the temperature was well into the 80s, and lines were long for anything to eat or drink. I didn't try for any refreshments, because of the lines and because I had an illicit can of diet orange soda in my purse. 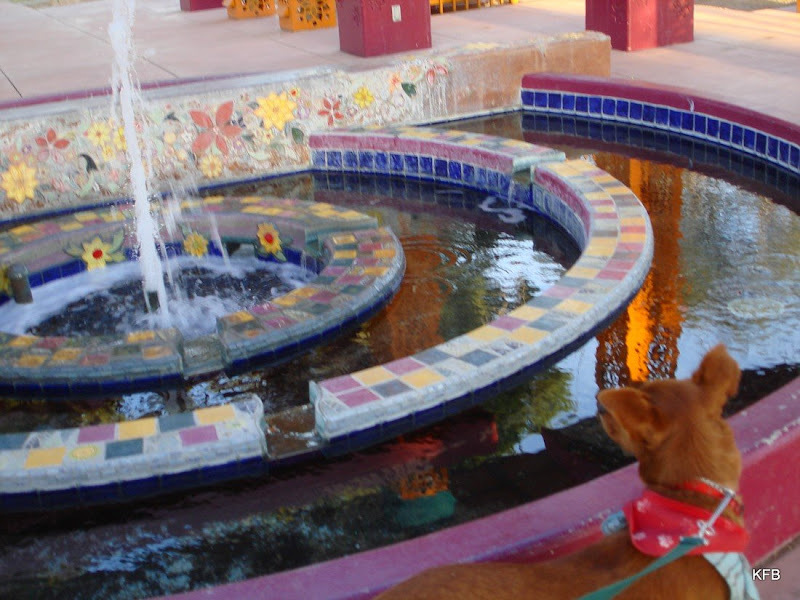 By the time I got to the basset rescue group, the heat, dehydration and exertion of walking around and untangling the dogs' leashes about once a minute were getting to me. The Red Cross isn't kidding about exercise on the day you give blood. I was only walking around and thought it would be all right, but an hour in the sun without food or drink was too much. The basset folks let me borrow a chair and sit in the shade for a few minutes, and after that I sat at a picnic table behind the SAFE adoptions tent and drank my soda, while Pepper strained to get closer to the cats up for adoption. 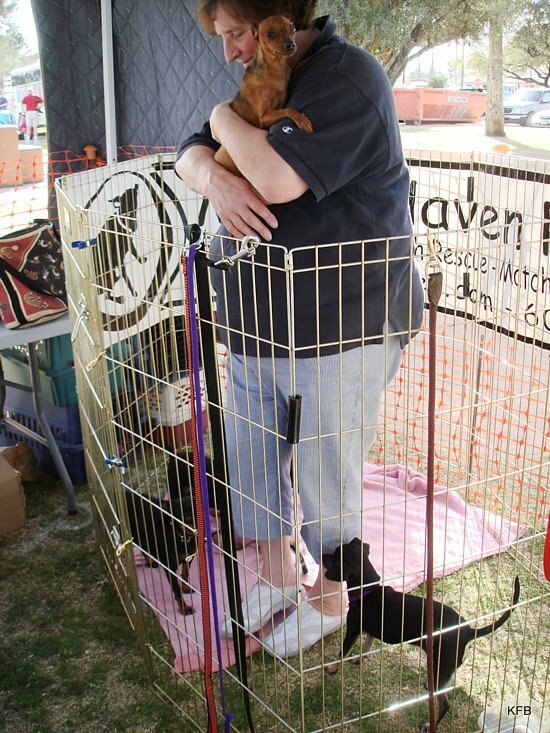 At one point Pepper and Cayenne both walked into one of SAFE's dog pens, just to get closer to a cat! It may well have been a pen Pepper rode in on trips to PetSmart adoptathons before we got her. From there we went to the dog park a few hundred feet away. I sat in the shade, and even the dogs weren't keen to do much running around by then. Soon we made the trek back to the car. Once we were home, the dogs both stretched out on the floor of the den for a good rest. I took 159 photos today, many of them for this week's Round Robin Photo Challenge, "Light Moves," as suggested by Julie and chosen by Steven. I strongly suspect that I've got about a week's worth of material here, but for this first installment let's narrow my focus a bit. 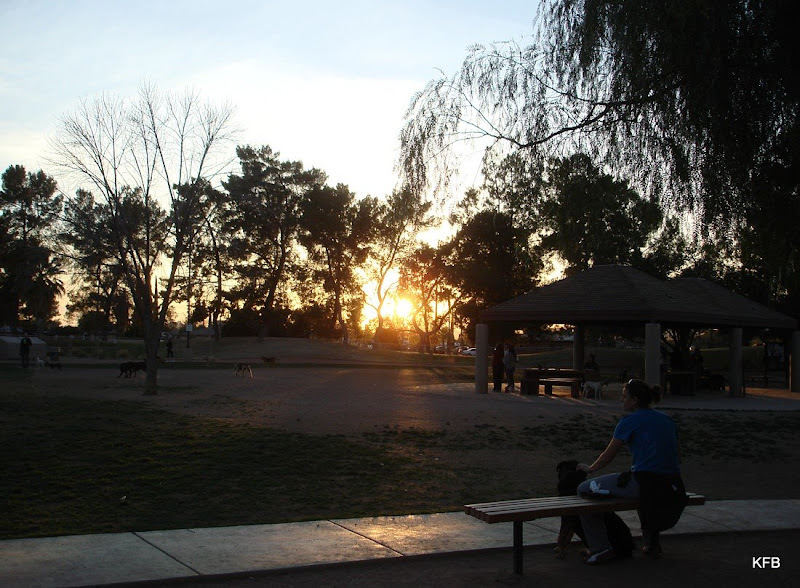 This entry is about the movement of light in Reid Park as the sun falls toward the western horizon. 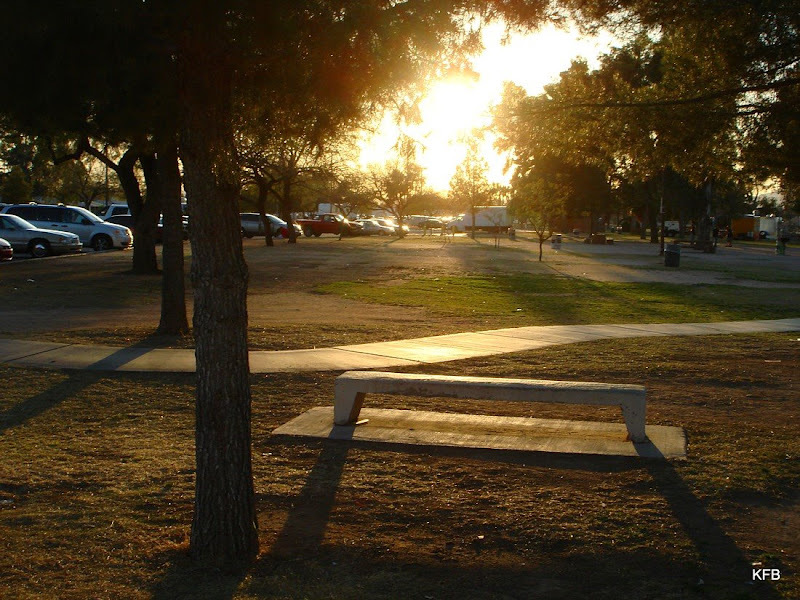 Stick around; there's a lot more to Reid Park than you've seen in this blog to date. Today the dogs and I went exploring! 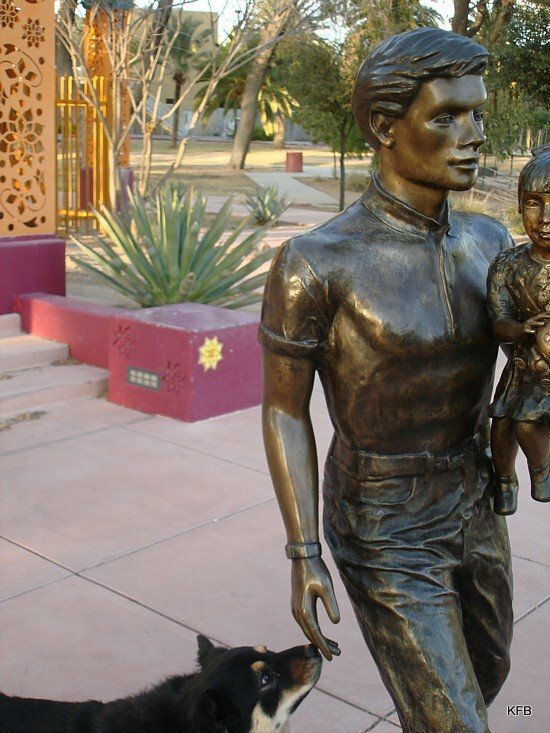 When we arrived at Reid Park in midtown Tucson around 5:15 PM, there were already long shadows, but still plenty of sunshine. 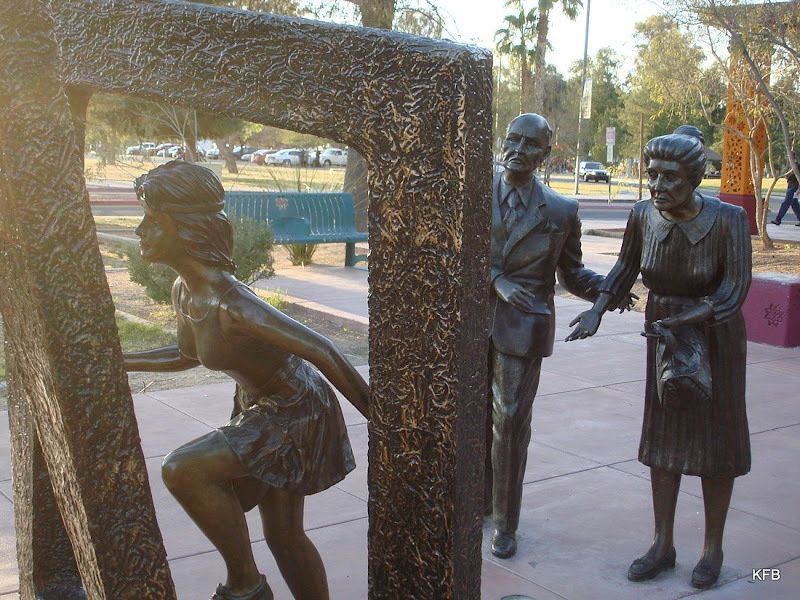 I parked in the lot that edges 22nd St. and led the dogs past this rather beautiful doorway sculpture, bound for the "other" duck pond. Unlike the duck pond we visited on Monday, this one (which is adjacent to the other one) lacks a fountain. Still has lots of ducks, though, and people to feed them. I got much better pictures (or at any rate, different ones) on this second attempt to photograph dogs and ducks, with lots of light effects on the water. 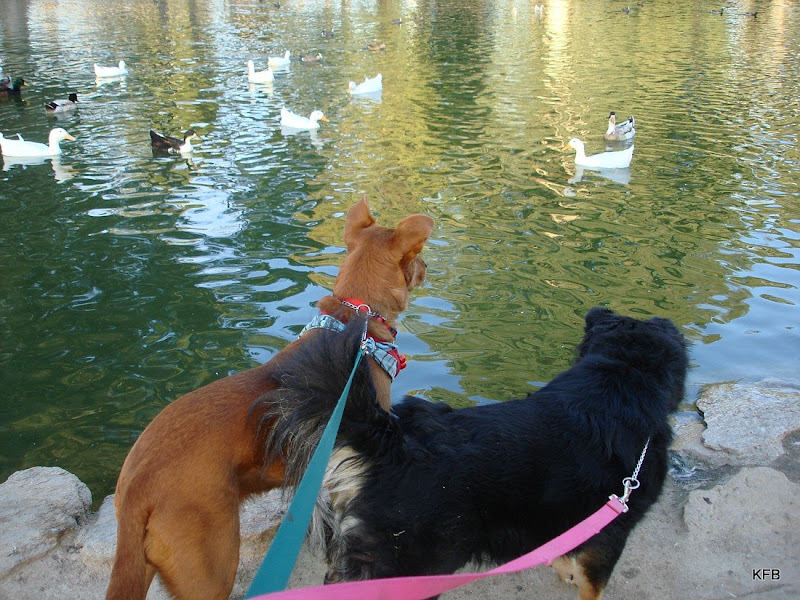 I've added them to the Picasa Dogs and Ducks album. 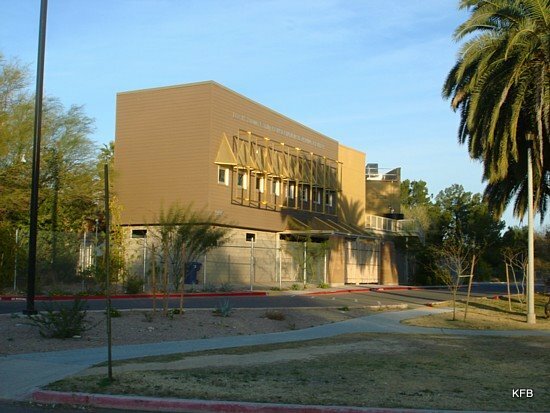 This Conservation Learning Center is solar powered. Notice the ground is entirely in shadow by this point, not to mention the tree-shaped shadows on the front of the building. 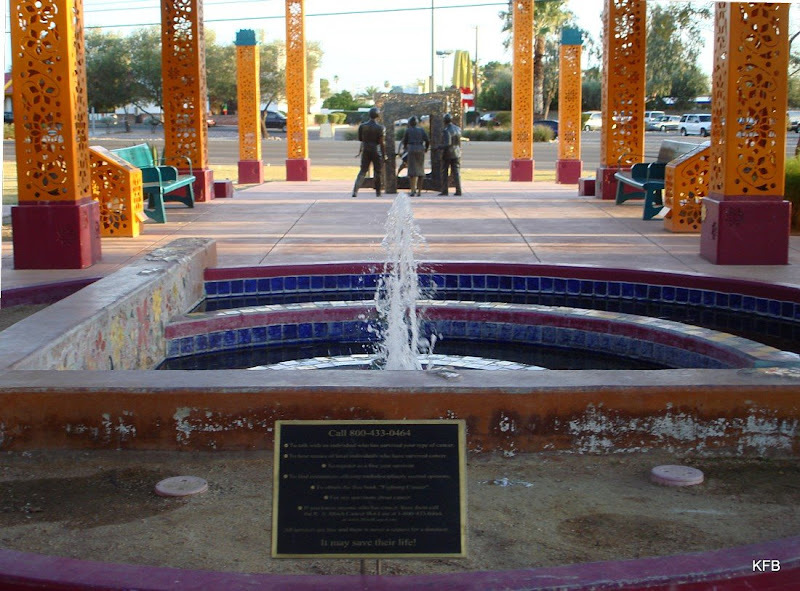 After the duck pond we visited the Cancer Survivors' Plaza, which is where this fountain is. Notice the colors reflected in the water. That's also a light effect. 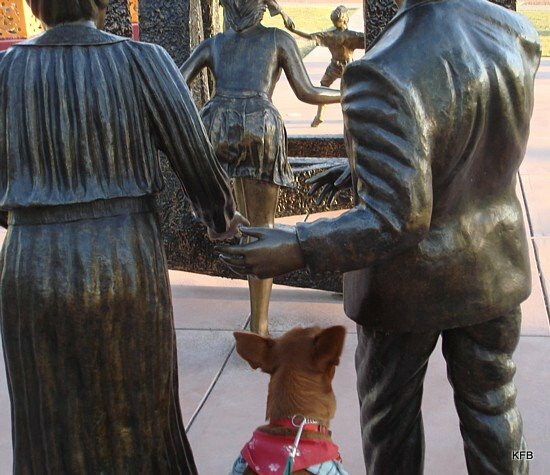 Pepper checks out one of the figures in the Cancer Survivors' Plaza installation. 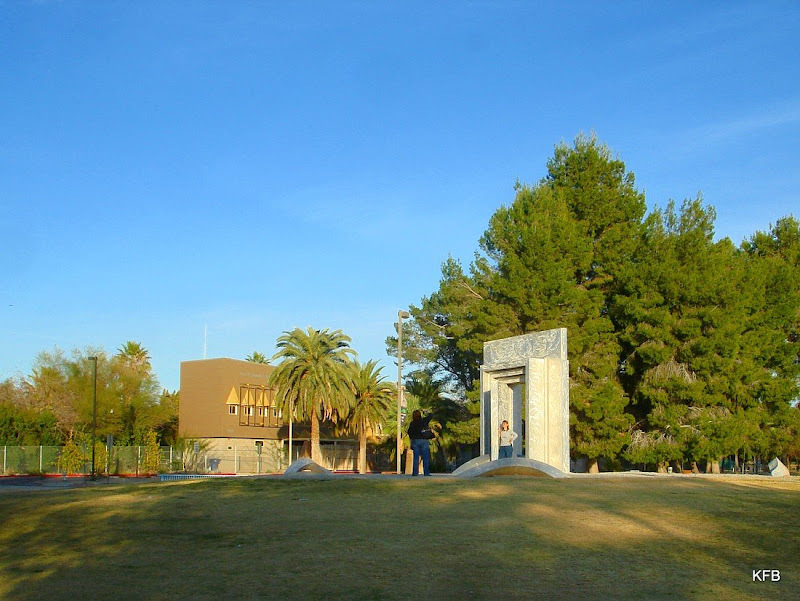 I'll do a whole entry on this local landmark soon. For now, notice the light shining on the man's shoulder. More light and shadow at Cancer Survivors' Plaza. 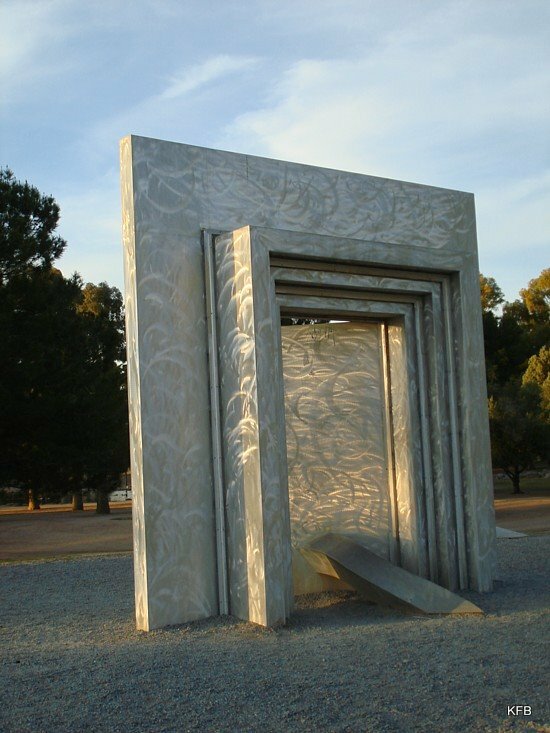 The ground was in shadow as we passed the doorway sculpture on the way back, but I love the way the light that remained was shining on the "door" itself. By the time we returned to the car it was clear that the light of the sun would soon move beyond the horizon. Meanwhile, it was time to go to the dog park! We could have walked there, but we didn't. Sunset at Miko's Corner was imminent when we arrived. We stayed for a shorter time than usual and left right at sunset. I took the dogs to the car...and that's when I saw the horses. Not to mention the mule! It turned out that some white tents I'd noticed earlier were being set up for some kind of animal rescue fair the next morning. 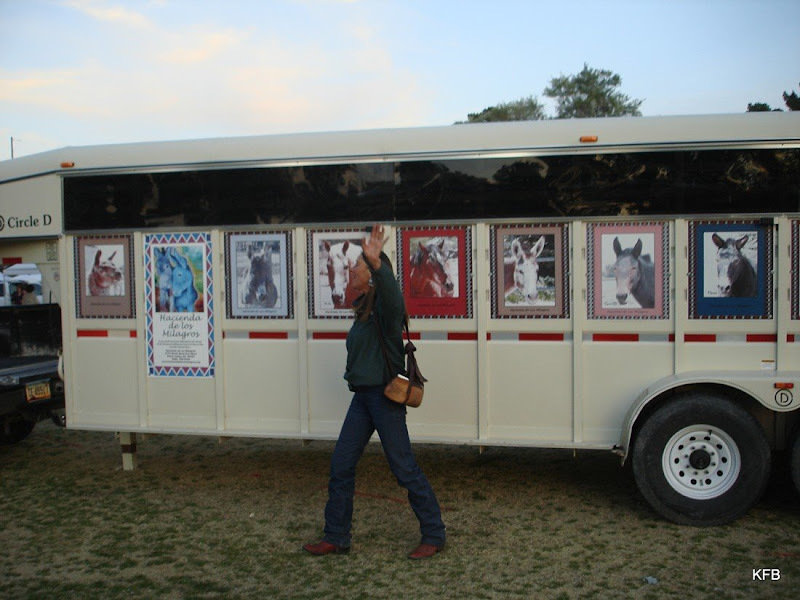 I took Cayenne and Pepper to see the mule and some horses, but they barely seemed to notice. At one point one of the mares moved suddenly, which brought forth a startled bark from Cayenne. Other than that, nothing. I'll be going to the animal fair when it's properly open, and will report back tomorrow night. In the meantime, let's see what everyone else came up with for the topic Light Moves! 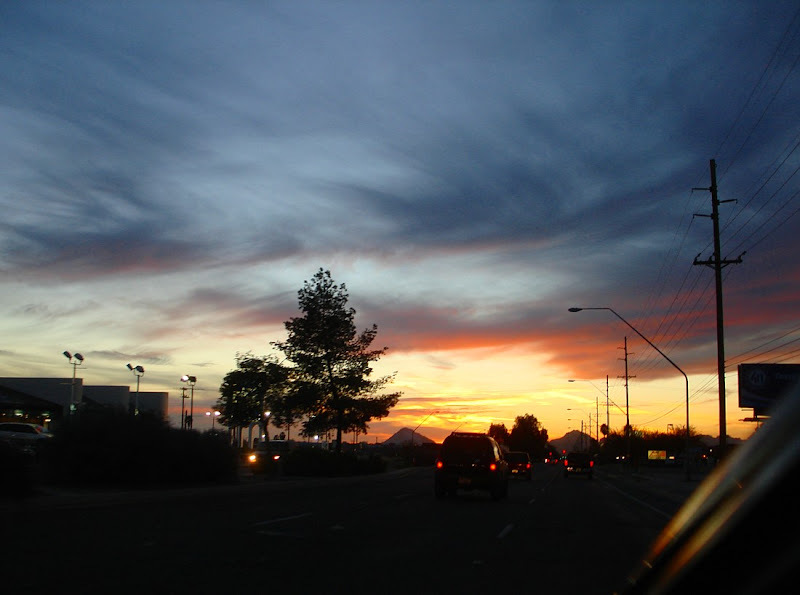 CVPhotographs ***Welcome new member*** - Posted! MollyMavis (Visual Dialogs) **New Blog** - Posted! Weekend Assignment #256: Is It Tax Time Yet? Have I Mentioned How Frustrating This Is?